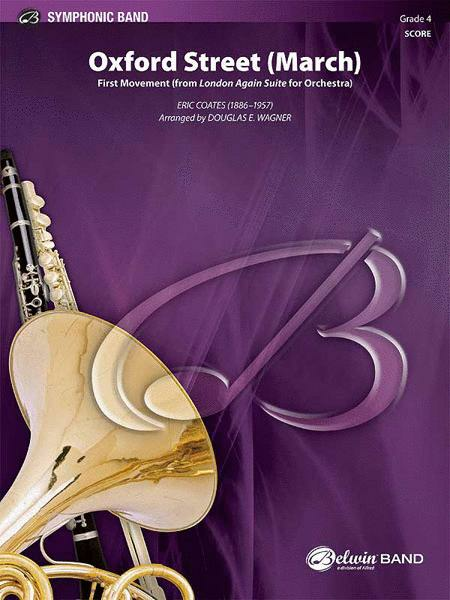 First Movement (from "London Again" Suite for Orchestra). Composed by Eric Coates (1886-1957). Arranged by Douglas E. Wagner. Concert Band; Performance Music Ensemble; Single Titles; SmartMusic. Pop Symphonic Band. Form: March; Transcription. Part(s); Score. 238 pages. Alfred Music #00-30830. Published by Alfred Music (AP.30830). This first-ever transcription of the opening "march" takes the listener to the hustle and bustle of London's west-end shopping district. Dubbed the "uncrowned king of light music," Coates' instantly recognizable scoring in a march-style is a certain winner for Douglas Wagner's new concert band setting. Full of energy, Oxford Street (March) will be a cherished addition to any program. This title is available in SmartMusic.